Experimenting with chemicals can be educational, but you need to use proper safety procedures to keep yourself safe. 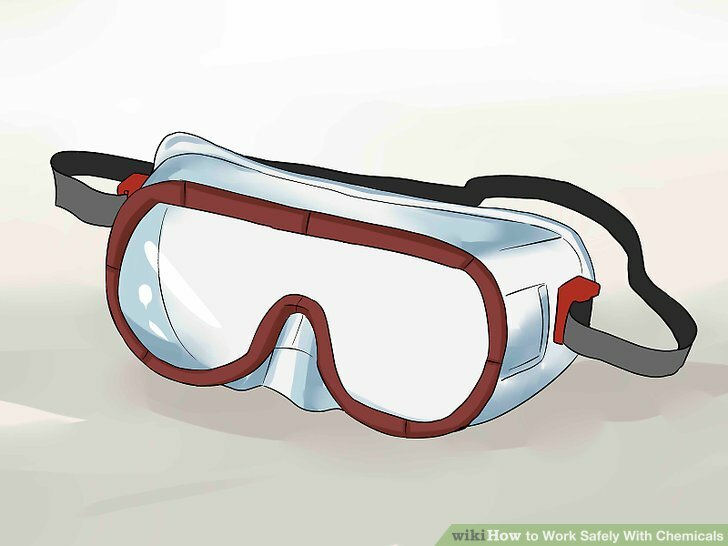 It is important to wear proper safety gear to avoid burning yourself, inhaling chemicals, or injuring yourself. Refrain from handling chemicals in unsafe locations or without proper equipment. Splash goggles cover your eyes entirely. Other eyewear, including prescription glasses and contacts, will not provide adequate protection. In some cases, additional eye protection will also be required. When there is a high likelihood of heavy splashing or implosions, additional protective wear might be necessary for your face. This could include a laboratory bench shield and/or a face shield. 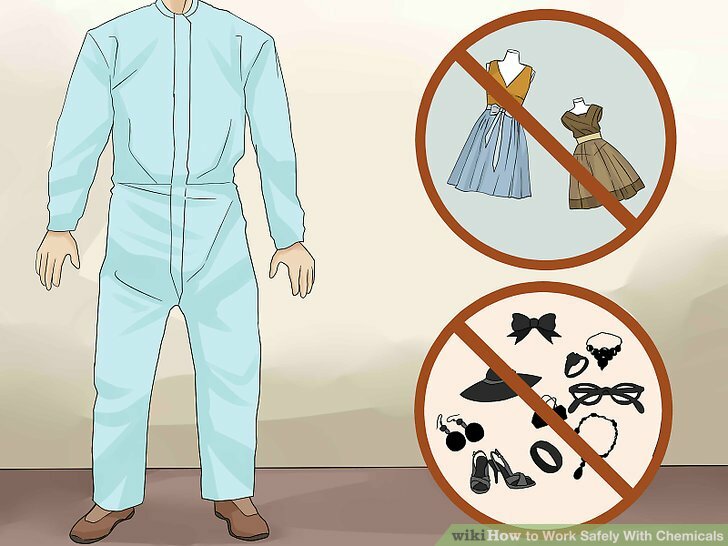 Your clothes should cover up most of your body so that if there is a spill chemicals do not get on you. Refrain from wearing skirts and dresses. Don’t wear anything that is loose and hangs from your body in such a way that it could hit or fall in chemicals. Don’t wear jewelry. Jewelry in the laboratory can cause many problems and should be removed. It can be ruined by corrosive chemicals, get in the way while handling material, and expose the wearer to the possibility of electric shock. Don’t wear loose sleeves that hang down low. You should cover your daily attire with an extra layer of clothing that is fire resistant and easy to remove. This is necessary to prevent damage from splashing and fires. 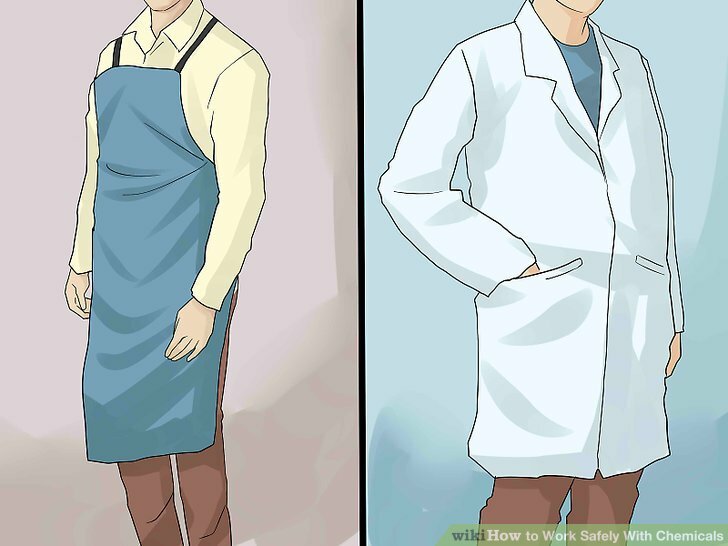 Typically, aprons will work, but a lab coat can also be used. If you are using a lab coat, be sure that the buttons on the coat snap open and closed. The coat should be easy to remove quickly in case of contamination. Normal buttons can make it difficult to remove the coat quickly enough. Sandals will expose your feet to damage from splashing chemicals. The top of the shoe should be made of leather or an artificial leather substitute for protection. Do not wear shoes with tops composed of cloth or woven material, as chemicals can seep through the material. 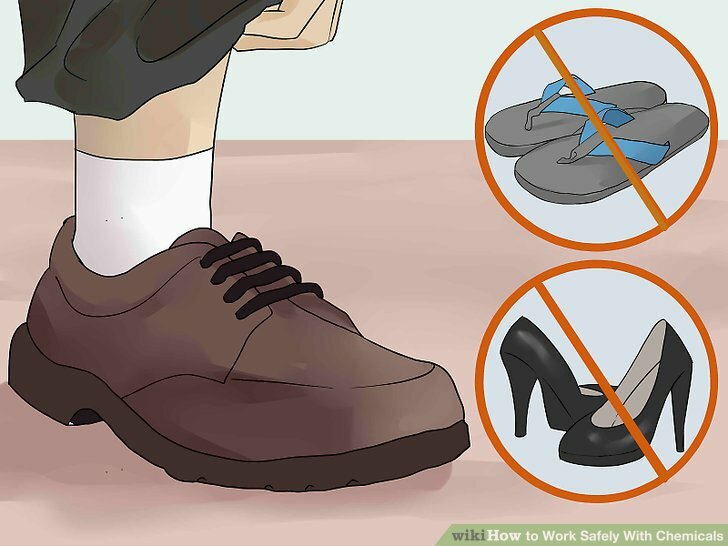 You should also refrain from wearing high heels in the lab. 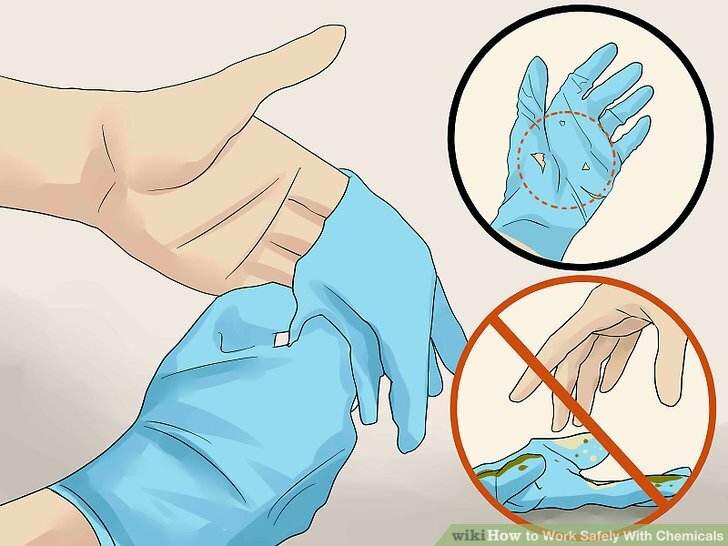 Latex, neoprene, and butyl rubber gloves will protect your hands from chemicals, but cloth and leather gloves will not provide sufficient protection. 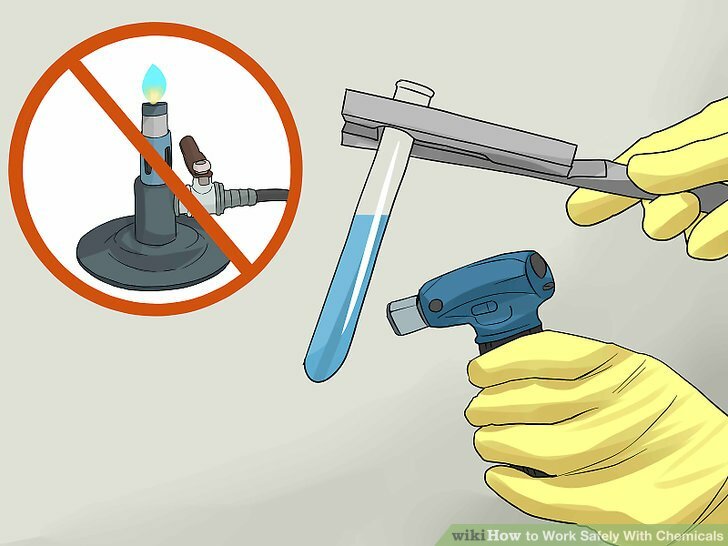 Remove gloves when leaving the laboratory to prevent exposing outside materials to toxic chemicals. Before using the gloves, check to make sure that there are no cracks or holes in them. Do not reuse soiled gloves. Chemicals will eventually permeate the gloves and reach to your skin. Toss gloves out in a can designated for disposal of toxic materials. Keep your hair out of your face. Put long hair back into a ponytail or bun. Push bangs out of the way with hairpins, clips, and headbands. 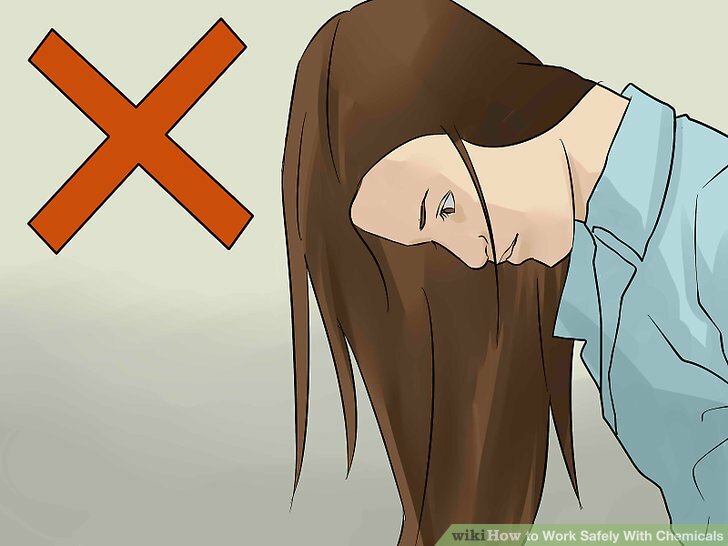 Long hair can accidentally fall into corrosive material or get stuck. Keep emergency equipment on hand. The laboratory should be equipped with a fire extinguisher in case flammable substances are being used. Do not, however, attempt to use the extinguisher if you are not trained in its use. The location should also have eyewash or shower stations to remove chemicals in case of exposure. 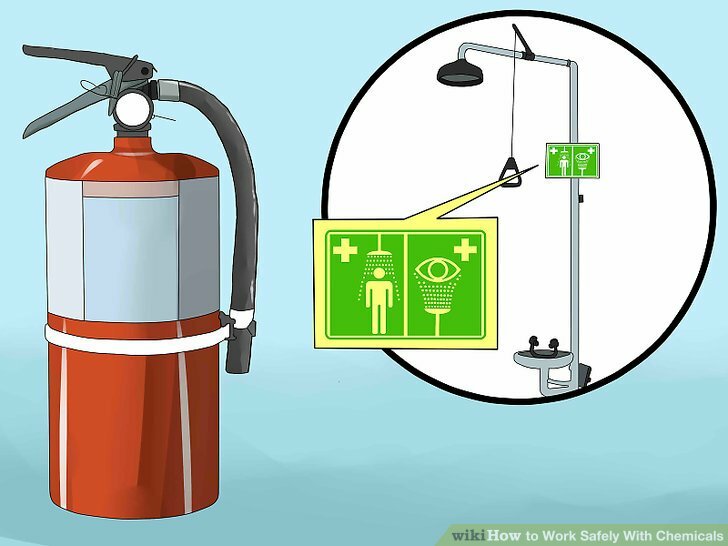 If you are not trained to use a fire extinguisher, flee from the location in case of emergency. The location should have both a primary and secondary exit, in case one exit is obstructed by fire. Be sure that everyone in the lab knows where to assemble in case of fire. After everyone is removed from the site, someone should take roll call and establish that everyone has been evacuated. If someone is injured, keep him warm. 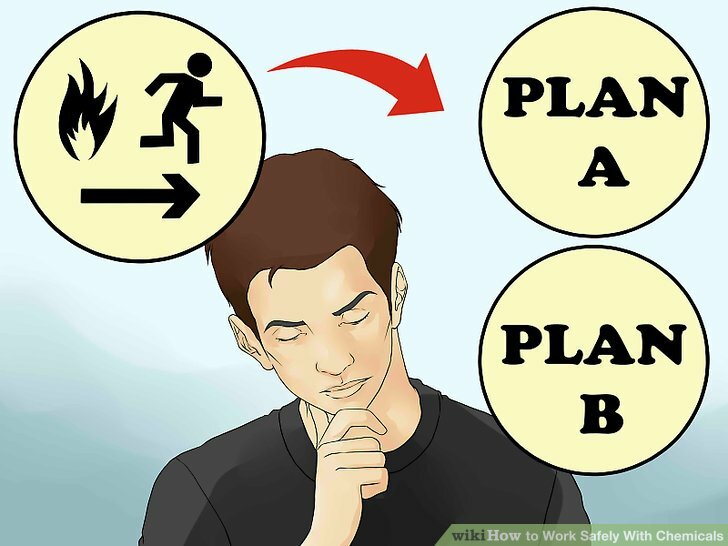 Do not attempt to remove him from the location, unless he is immediately threatened by fire or chemicals. Use a room with ventilation. It is important to have ventilation in the room so that toxic fumes don’t accumulate and threaten your health. How much ventilation is necessary depends upon the type of chemicals you are using. Sometimes a single exhaust fan will be sufficient, other times an entire system of hoods and ducts might be necessary. Ask a professional, like a teacher, about how dangerous the fumes from the substance are. Verify that the location is safe enough for the chemicals you are using. Unnecessary objects at your work site can get in the way, resulting in accidents. It is particularly imperative that nothing be left on the floor. If you trip on these objects, it could cause a spill and result in considerable damage. 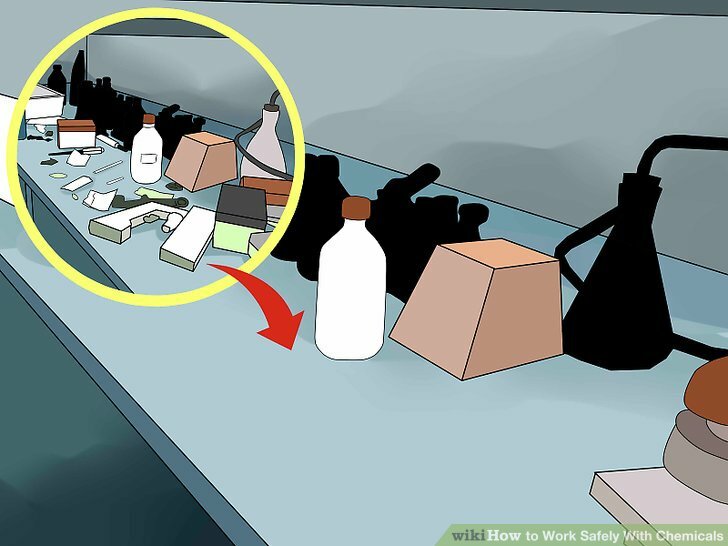 Keep chemicals in a safe, segregated location. Drinks, foods, and cigarettes should never be in the same room as toxic chemicals. Keep chemicals out of direct sunlight and other heat sources. Keep chemicals in a location that is fire resistant. 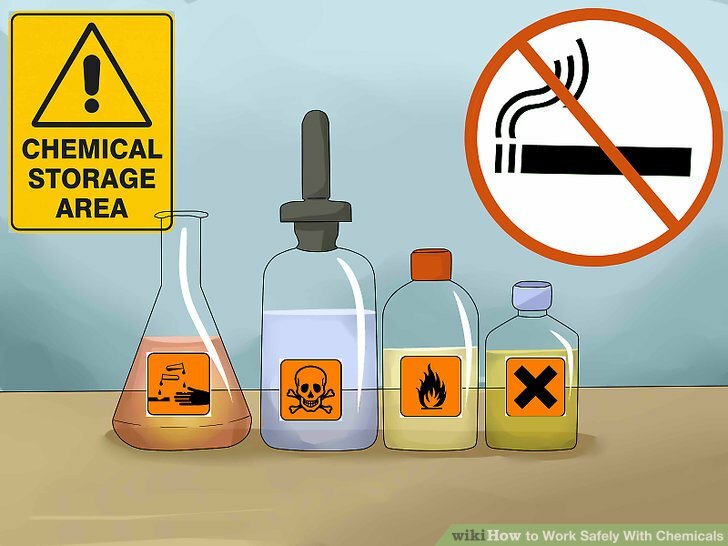 It is particularly imperative not to smoke in proximity to chemicals, because this could easily create a fire. Chemical reactions are complex and often dangerous. Unless you are extremely knowledgeable of how chemicals interact with each other, do not substitute one for another. Always follow directions precisely. Be sure that you have a clearly designed plan before you begin working with chemicals. If you do know for sure that you can substitute one chemical for another chemical that is less dangerous, do so. Do not use chemicals if the container has been compromised with cracks or other signs of damage. Also, do not use the chemical if the label has been removed or appears as if it could potentially have been altered in any way. You must be positive that you are using the appropriate chemical. Each chemical should be labeled with an MSDS that provides comprehensive instructions. It should include information about proper safety gear, chemical hazards, proper handling procedures, and emergency procedures. Most relevant information should be here. Pay heed to it. 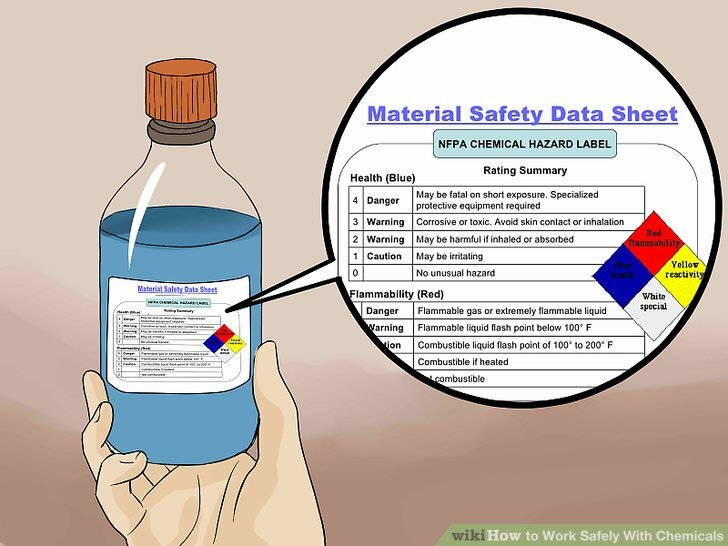 MSDS stands for Material Safety Data Sheet. As the name indicates, it should provide a nearly comprehensive accounting of how to handle a chemical. 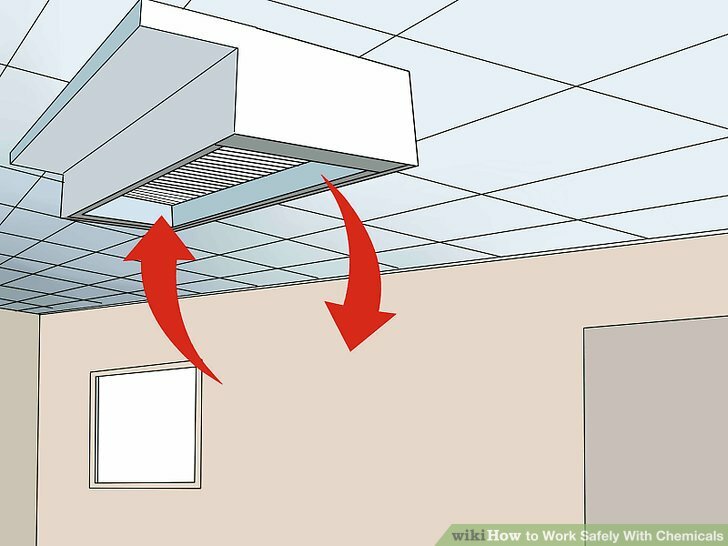 The MSDS should include a ceiling limit, which is the maximum amount of the chemical that you can be exposed to in a specified time, usually 15 minutes. The flash point is the temperature at which an active flame can cause the chemical to combust. The auto-ignition temperature is the lowest temperature at which the chemical can spontaneously explode even without exposure to a flame. Whenever possible, use an electric heater or hot plate instead of a gas burner. Check the auto-ignition temperature listed on the MSDS and do not allow the temperature to reach that point. Do not heat chemicals in a closed container. 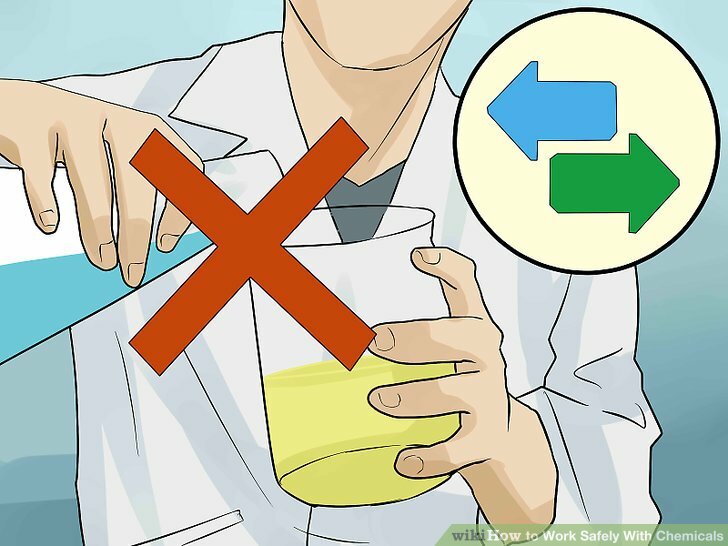 Stirrer motors, vessels, separatory funnels and all other laboratory equipment should be firmly secured so that chemicals are not spilled. 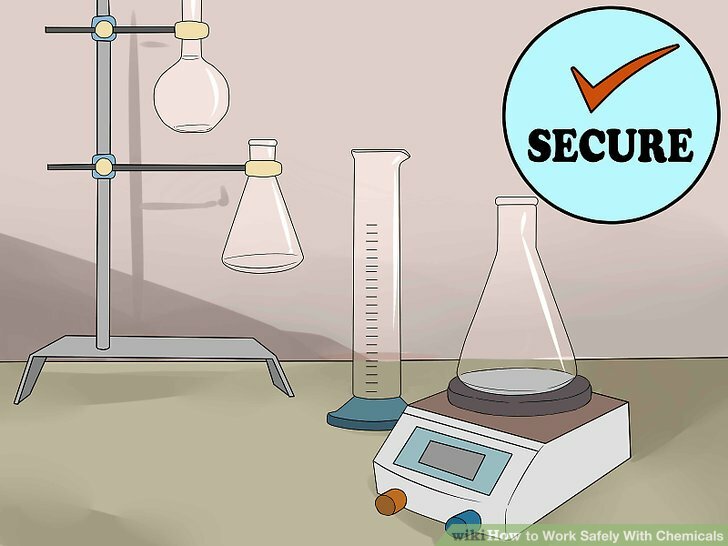 Do not use any laboratory equipment that appears to be cracked, has frayed wires, or does not seem secure. 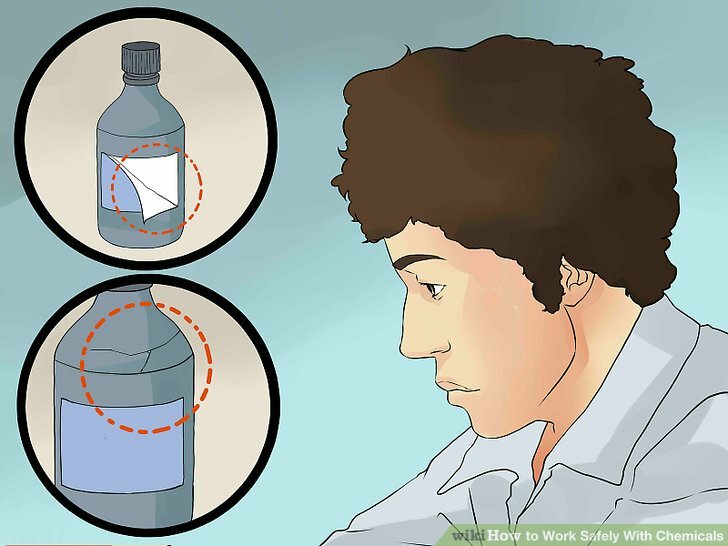 Even if the chemicals were not particularly abrasive and you do not believe that you were exposed, you should still take precautions to remove them. Wash hands thoroughly after working with chemicals. Shower when the opportunity presents itself.